Here at Tarpco, we not only custom make new tarps to spec for Side Kits, Crank Systems, Side Rolls and Tarplocks, but we also make custom lumber, steel, flat, machinery, gravity wagon, container, asphalt, and many other types of tarps. When these tarps get used as much as they do, things happen to them. They get beat up from the weather: rain, snow, sleet, ice, hail, and heat. They get runover, smashed, poked, burned, & torn. When all these things happen to your tarp, it's time to have us fix them. Don't put tape on them or try to fix them yourself. Bring them to the Tarpco Repair Department. 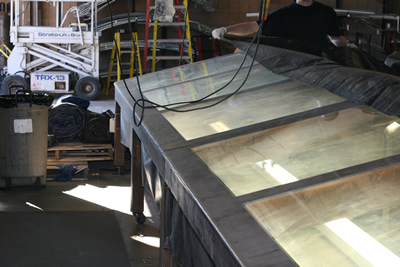 When you bring a tarp in for repair at our Repair Department, we go over it from top to bottom. First we evaluate the value of the tarp versus the amount of time & money required to fix it. 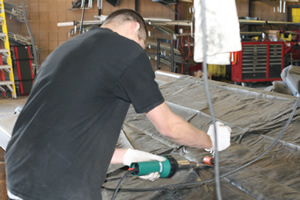 We will not waste your time and overcharge you to fix a tarp that is dry rotted or too badly damaged. Our expert repair team will patch all holes, repair tears and re-sew the webbing. In return, your tarps life will be extended all while saving you money. Call us today and let us help repair your tarps to how they once were. © 2008-2014 Tarpco. | This page rendered in 0.00524 seconds.